Use not more than 3 to 4 times daily. Apply pain patch to areas affected by pain. For children under 12 years of age, consult a doctor before use. 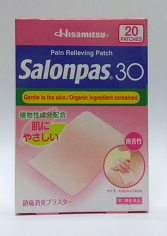 Salonpas 30 Pain Relieving Patch is a new and improved pain patch specially designed for sensitive skin. Salonpas 30 Pain Relieving Patch is specially designed to be smaller in size so as to effectively target only those areas that need pain treatment. Salonpas 30 Pain Relieving Patch's formulation is gentle to the skin. It contains organic ingredients and is specially made for painless removal after use. Salonpas 30 Pain Relieving Patch generates increased warmth to provide relief from your pain and stiffness, and helps your tense muscles relax to increase mobility. Clear expectations re delivery timeline, web site well designed and responsive. Also feel that site is secure, i.e. trustworthy. Good way to acquire otherwise impossible to safely obtain superb consumer products from abroad. C. O. Its a cooling relief for muscular pain Maree A.